Watch the introduction, then click on Chapter 1 and Chapter 2 in the menu on the right. Birds like cocoa trees too! Follows the story of the world’s most popular treat from its origins in the rainforests of Central America to shops and factories everywhere. Featuring the humorous illustrations of Adam Larkum. Hard to judge a reading series by one book alone, but this title has all the right ingredients and even a recipe. Simple text is complemented by quirky cartoon-like artwork, while speech bubbles inject humour and help the story along. 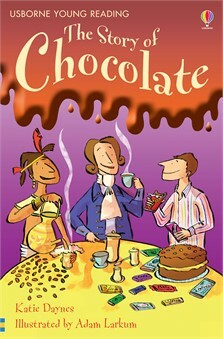 Usborne describes the books as "stories" for newly independent readers, but this one belongs more comfortably on the non-fiction shelf, tracing the origin of chocolate from the South American rainforest to the sweetshop. Mayan kings and priests liked their cocoa cold and frothy, but the Spanish, who learned of cocoa from the Aztecs, preferred theirs hot and sweet. It is fascinating to read that the world's most popular treat has such a weird history. This book will take you from cocoa beans to Cadbury's, Lindt and Hershey's.